It’s another picture of the week! I’ve been having trouble working out the focus on my new camera so it’s always great when something really small wonders my way to get some practice in. Now, you have to understand in Leeds there is very little to photograph in the way of ‘interesting’. Me and my dad saw some ducks fly by on Saturday but that’s about as interesting as it gets before you have to go somewhere like the farm. I was watching Gamer TV (Sam Delaney, he’s great) and my grandma was over and I wasn’t really paying much attention to it because a little itsy-bitsy spider was crawling on my jeans. I followed it for a good 20 minutes or so taking photos and trying to work out the focus and I did a pretty good job when it finally stayed still. 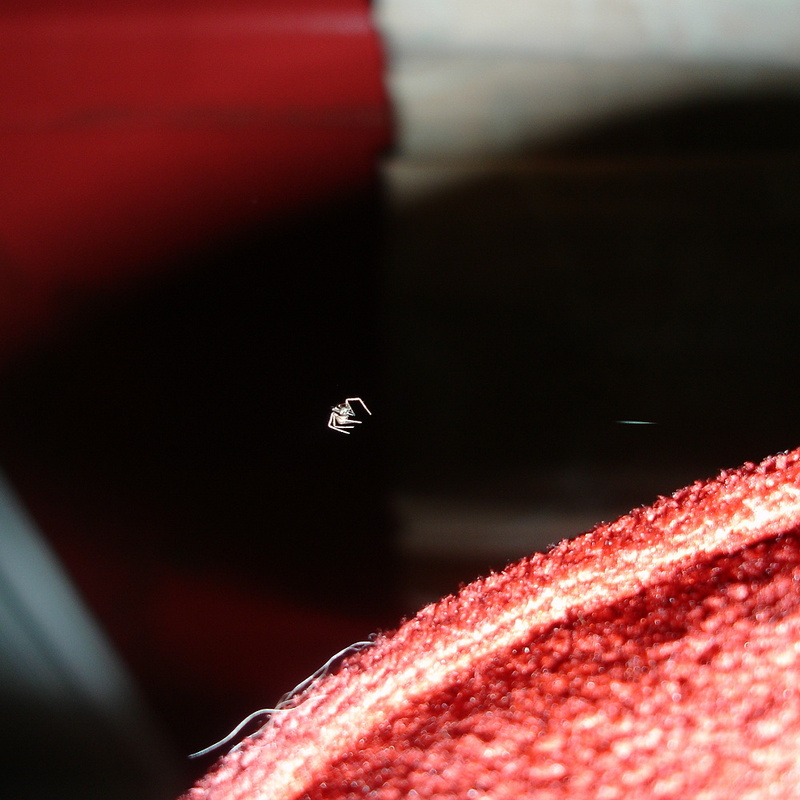 What was weird was all of sudden the spider began to rise up into the air from the sofa, and I couldn’t work out where it’s web was. Needless to say he didn’t make it to the roof but crash landed on the floor and went back to the sofa. Yes.. It may be like watching paint dry to some but taking photos of this spider was actually a highlight of my day. W00t! I’ve just uploaded my 20th Bootleg Remix. This is just one of the very first one’s I made, tweaked for release. The page, as you’ll see, has been given a makeover which I hope makes things easier to find. I’m getting to grips quick with my camera so I think doing that ‘Photo of the week’ thing will be okay.. Even if sometimes they won’t be all that interesting. Who cares, at least I’ll find them interesting! I don’t post all that often because I never have a lot of interesting things to write about. I got my camera for my birthday and thought I might (try) and do a Picture of the Week feature – So here’s this week’s picture, and the story behind it. 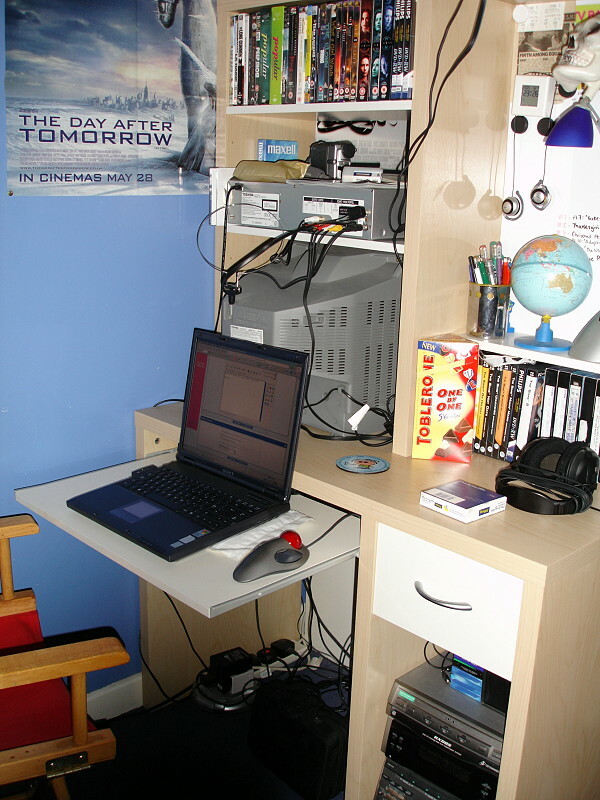 This is my desk which I got for my birthday last year, I saw it at the hopsital and realised it would be perfect for my bedroom because I could have it at the end of my bed and the wires from my TV can go into my laptop (Capture Card) – I also set up my tv to the stereo which also has Surround Sound that I’d been keeping stored away because I never had nowhere to put them. It is complete now and took me around 4 years in all to create. My bedroom’s great and I spend a lot of time in it but MY GOD is it hot in here today! I have uploaded my first ever photos taken with my new camera – They’re nothing special, except you can see a before and after photo of my hitman line.